In the 1970’s, Chushiro Hayashi lead a research group at Kyoto University which proposed a fundamental creation scenario. To this day, the Kyoto Model is still used and expanded on for planet formation theories. The vast majority of particles in outer space are spread extremely thin. Yet, in certain areas the density of these particles is relatively higher than that of the surrounding areas. These areas are called ‘molecular clouds.’ Molecular clouds coalesce using strong gravity, and their density steadily increases until a star is born. Although the molecular cloud is extremely large, the resulting star is extremely small in size. At the start, the speed of rotation is very small, but as the cloud becomes more densely packed, the rotation starts to accelerate, rotating rapidly. Much like a figure skater whose arms are stretched during a spin, when they pull their arms in, the speed of the spin increases. The molecular cloud will coalesce under its own gravity from every direction. As the rotation speed of the molecular cloud increases, the centrifugal force acts upon the cloud perpendicular to its vertical axis of rotation, it flattens into a disk as it spins. The resulting formation is a thin disk-shaped structure. The completed circular formation is called a “protoplanetary disk.” Planets are then born inside the protoplanetary disk. Stars, including the sun, are mostly a collected mass of hydrogen and helium. For that reason, although the protoplanetary disk is made up of 99% gas, the remaining 1% includes micrometer sized dust particles. A planetesimal continues to incorporate more dust in relation to its gravity. When this happens, the planetesimal becomes larger, and its gravity grows stronger, which in turn, collides with more dust, and the pace of sticking dust particles becomes faster. In other words, at first, the planetesimal grows slowly at fist, and then grows more quickly the larger it becomes. This process is called “runaway growth.” Runaway growth continues to occur on appropriate places on the planetary disk. The result is that the first planetesimal, little by little is formed into a protoplanet. This process is called oligarchy growth. A protoplanet becomes about the size of Mars, and has the orbit of the Earth (about 1/10 of the Earths weight). However, when its orbit is near that of Jupiter past the snow line, it has a solid mass of ice, and the planetesimals can grow into protoplanets that are 10 times as large as the earth. Over long periods of time, the individual protoplanets’ gravity causes disturbances in the orbits of other protoplanets, causing them to collide and merge. When these larger protoplanets collide, the resulting collision is called “giant impact.” For example, when Earth was created, it is believed that the giant impacts of ten Mars-sized protoplanets formed an object the size of the Earth. This is how the protoplanets merge to become large enough that an Earth-like planet is formed. Incidentally, at the time of giant impact, fragments from the collision scatter around the planet. When these fragments gather together, a ‘moon’ is created. Whenthe size of a protoplanet increases, it starts to capture the surrounding gases from the original protoplanetary disk with its gravity. At this time, if the protoplanet’s weight is about the same as earth, the captured gas is supported by atmospheric pressure, and there is a possibility that it can support a steady atmosphere. However, if the protoplanet’s weight is around ten times that of Earth, the gravity becomes too strong, and the captured gas cannot be supported by atmospheric pressure alone. The resulting effect is that the protoplanetary disk’s gas rushes towards the protoplanet, the influx of the surrounding gas cannot be stopped until it is all lost. However, the formation of protoplanets in extremely far orbits take a long time to develop. In cases where a planet is ten times the size of Earth it is formed so far away, there may no longer be protoplanetary disk gas remaining, and “ice giants” are formed instead. 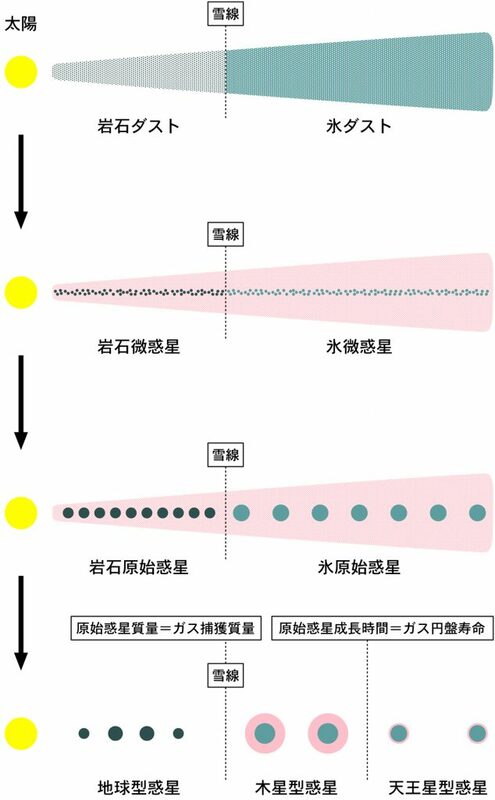 The above scenario was proposed for the sake of explaining the formation of the origin of the solar system. However, only the fundamental laws of physics are applied when exoplanet formation is considered. Of course, within all of the exoplanets, there are a lot of Hot Jupiters and Super Earths, as well as other types of planets that don’t exist in our solar system. However, expanding the Kyoto Model, a lot of research is being done to explain the formation process of these ‘strange’ planets. Conversely, the planets of our solar system don’t have a miraculous or special existence, is is probable they were formed the same way that all exoplanets throughout the universe were formed. Copyright © 系外惑星データベース All Rights Reserved.